ON NOVEMBER 23, TIME LIFE WILL UNLEASH A BIONIC COLLECTOR'S DVD SET FROM ONE OF THE '70s MOST ICONIC, FAN-FAVORITE PROGRAMS - NEVER BEFORE AVAILABLE ON ANY FORMAT! Including All-New Interviews with Lee Majors, Richard Anderson, Lindsay Wagner, Executive Producer Harve Bennett; Multiple Original Featurettes; Audio Commentaries and Much More! FAIRFAX, VA - On November 23, 2010, Time Life - the home of such classic TV as GET SMART, THE MAN FROM U.N.C.L.E and THE SMOTHERS BROTHERS - will debut a DVD collector's set of one of the most eagerly-anticipated, previously unreleased TV classics with THE SIX MILLION DOLLAR MAN: THE COMPLETE SERIES. This definitive set from one of the iconic pop culture smashes of the '70s is now available for pre-order exclusively online at 6MDM.com, and will feature all five action-packed seasons never before available in the U.S. on any format, as well as a stunning collection of all-new extras certain to thrill fans both old and new. *Note from the producers: Despite best efforts, Time Life was unable to locate the original master for "Welcome Home, Jaime - Part 1," therefore, the syndicated version appears on these DVDs. 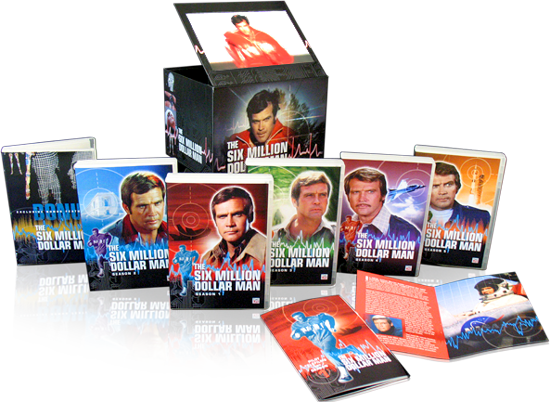 As the OSI did with astronaut Steve Austin, Time Life has the technology and capability to make the world's most singular Six Million Dollar Man completist's set better...stronger...faster. Enhancing the series long-awaited release are countless hours of bonus features, including intimate interviews with the cast and crew, including Lindsay Wagner (Jaime Sommers), executive producer Harve Bennett, and writer Kenneth Johnson. Also featured are a staggering seventeen original featurettes, on everything from "Real Bionics: How Science Fiction Is Becoming Science Fact" and "The Bionic Sound Effects", to "The Search for Bigfoot" and "The Six Million Dollar Man's Best Villains, Best Fights"; the two-part featurette "TV Goes Bionic: The Untold Story of The Six Million Dollar Man" (which goes behind the scenes to explore the series like never before), and several featurettes celebrating the series V.I.P. guest stars such as Lee's then-wife, Farrah Fawcett-Majors (who made four guest appearances), Andre the Giant, Kim Basinger, Sonny Bono, Lou Gossett, Erik Estrada, Stefanie Powers, John Saxon, Cathy Rigby, William Shatner, Suzanne Somers and many more. Additionally, there's audio commentary on six episodes by writer Kenneth Johnson and director Cliff Bole, and an interactive bonus entitled "Bionic Breakdown" that will allow fans the ability to click on Steve Austin's eye, arm or legs to learn more about each one of his bionic enhancements; from night-vision to cauterizing veins to running speeds that exceed 65 miles per hour, "Colonel Austin's" skills and abilities are catalogued here with episode clips as a visual reference. The Six Million Dollar Fans: So Loyal, So Bionic! "The Bionic Woman, Part II"
"The Secret of Bigfoot, Part II"
Mini-Biographies of the actors and their characters: Getting to Know "Steve Austin", "Jaime Sommers", "Oscar Goldman", "Rudy Wells"
Interactive Bonus Feature: "Bionic Breakdown"
One of the pop culture smashes of the '70s, THE SIX MILLION DOLLAR MAN starred Lee Majors as Colonel Steve Austin, a top NASA pilot critically injured when his experimental spaceplane crashed. Oscar Goldman (Anderson), head of the OSI used Austin as a test subject for an experimental procedure, rebuilding his body using cybernetic technology, making him the world's first bionic man. Now, Austin works for Goldman and the OSI, protecting the nation from myriad threats. Based on the novel Cyborg by Martin Caidin, THE SIX MILLION DOLLAR MAN launched with several made-for-TV movies in 1973, which then spun off into a hit for ABC, running from January 1974 to March 1978. During its run, the program made Majors a pop culture icon, spawned three reunion shows, another series (The Bionic Woman, starring Lindsay Wagner) and thousands of licensed products, making THE SIX MILLION DOLLAR MAN one of the defining TV shows of the "Me" decade. The Six Million Dollar Man is a copyright and trademark of Universal Studios and used under license.